An anti-inflammatory agent, structurally related to the salicylates, which is active in inflammatory bowel disease. 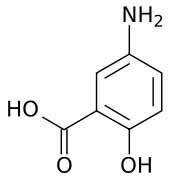 It is considered to be the active moiety of sulphasalazine. Application For the treatment of active ulcerative proctitis.